One of Dallas’ favorite sons, Marc Stanley, is in the news again. The national Jewish community and political leader will receive the Tikkun Olam Award from the Jewish Council for Public Affairs at its annual Plenum, March 10 in Washington. Stanley serves as chairman of the National Jewish Democratic Council and co-chair of the Foundation for Jewish Culture. In addition, he is an officer of the JCPA, and was appointed by President Barack Obama to the U.S. Holocaust Memorial Museum Council in June 2011. He was also appointed by Governor Ann Richards to serve as chairman of the Texas Public Finance Authority. In Dallas, Stanley serves as a vice chair of the Legacy Senior Living Communities and sits on the executive committee of the Dallas Jewish Community Relations Council. Stanley works as a trial lawyer and has also served as president of the Dallas Trial Lawyers Association and the Texas Trial Lawyer Association. As chairman of the National Jewish Democratic Council, he has blogged extensively about Jewish and political issues for The Huffington Post and other forums. David Steirman of San Francisco will also receive the Tikkun Olam Award this year. The JCPA Plenum is the largest yearly meeting in the Jewish community relations field in the U.S., according to a JCPA statement. If you are like me and have a simcha looming in the near future, then you were looking forward to Temple Emanu-El’s annual party expo, which had been scheduled for Sunday, March 3. Unfortunately, the Temple Emanu-El Brotherhood has canceled the event for this year. For information, contact, Jeff Light at alight@swbell.net. Celebrating the 100th day of school is a tradition at many schools. At Torah Day School of Dallas, kindergarteners are given an assignment to create a project for the 100th day by placing 100 objects on a poster board that can be hung on the walls. Some kids put 100 toothpicks, 100 stickers, 100 flowers and more. 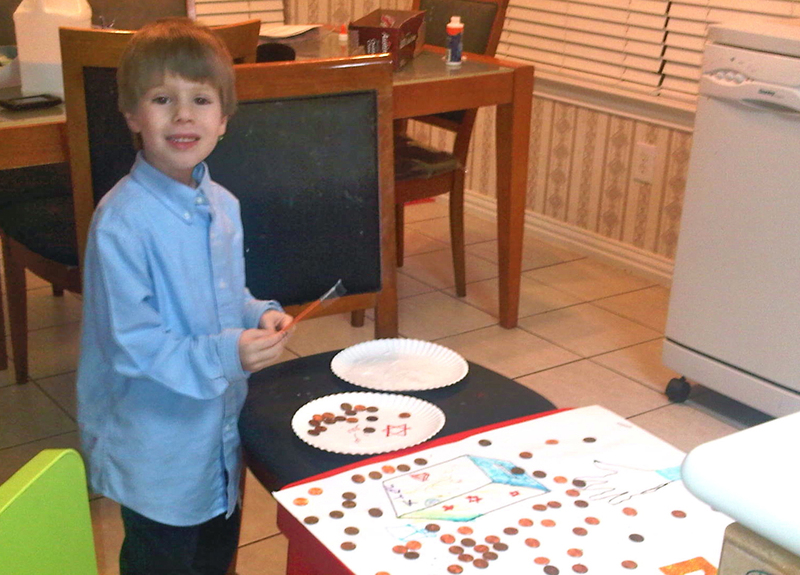 This year Jacob Rhoads, son of Marcy and Dale Rhoads decided to collect $100 for tzedakah. His project was called “100 days of Tzedakah.” He contacted his family, friends and even posted on Facebook to see if he could collect the money that he would then donate to his school. He spent many days reaching out, and he reached his goal. On the 100th day of school, he went to the principal’s office — not because he was in trouble, but to give him the $100 he had collected. Dallas Area Torah Association will host its fourth annual Wine Tasting Event at 7:30 p.m. Sunday, March 3 at its new Far North Dallas Center, 7130 Campbell Road, #204. All proceeds from this event will go to support the annual DATA Women’s Mission to Israel, slated for June 16-26. Each year, a new group of Dallas-area Jewish women join other Jewish women from all over the world in Israel for a 10-day, Birthright-like trip, connecting them to their roots and their Jewish identities. Since 2009, JWRP has brought more than 2,500 women from 40 cities and seven countries to Israel, most visiting Israel for the first time. The cost to attend the wine tasting event is $36 per person. Contact Rabbi Shlomo Abrams at 214-724-1007 or sabrams@datafarnorth.org to attend. Sponsorships are still available and include dinner with Palatnik before the event. The DATA Far North Center is located at at the Southeast corner of Campbell and Hillcrest roads, behind Natalie’s Kitchen. As we were going to press, Rose Biderman sent us an urgent reminder that payment is due March 4 for your reservation for the Herzl Lifesaver Luncheon at the Legacy of Willow Bend, 6101 Ohio Drive in Plano. Cost of the lunch is $18. The luncheon will include a raffle, door prizes and entertainment by Eli Davidsohn. The annual Lifesaver Luncheon supports the medical research at the Hadassah hospitals in Israel. Send your check to Sunny Shor, 7806 Royal Lane, #120, Dallas, TX 75230 or call 469-206-0648. The Lakehill Preparatory School Debate Team recently attended the YMCA’s 66th annual Texas State Youth and Government Conference held at the state Capitol in Austin. Two Lakehill teams participated in State Affairs Forum, in which teams take a pro or con stance on a key issue and engage in rounds of legislative debate. Clayton Drazner, Gaby Gonzalez and Jacob Graff drafted a proposal against the requirement of a passport to vote. Their team finished third in the state. John Devine, Matt Graff and Cris McCarty drafted a proposal against the privatization of the postal service. Their team finished second in the state. Devine, Drazner, and Gonzalez were awarded Distinguished Delegate medals. Sponsor Jamie Thorne confirmed that she was very proud of her debaters, calling them the “winningest” delegation at the state conference. Thorne says it looks like the team will again be invited to attend Minnesota’s State Model U.N. conference in March. For two years, Lakehill has been sponsored by the White Rock YMCA to serve as the pilot group representing Texas. Send your news to me at sharonw@texasjewishpost.com.